Yesterday I spent four straight hours after work in the garden. I must tell you that it felt so good. My “to do” list has been growing exponentially the past few days, and so many of the things on my list were related to the garden or putting up food. I still have a lot to do, but I feel slightly less overwhelmed today. I have recently come to grasp with the fact that our house will not stay clean during the summer. There just aren’t enough hours. End of story. Yesterday Matt suggested we hire someone to help clean, and well, I’m seriously considering that. 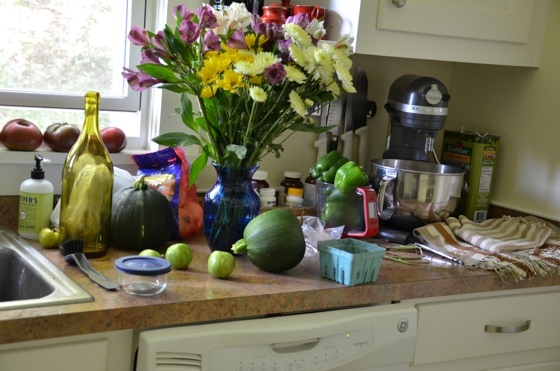 Mostly because my kitchen has looked like this since July. I am quite tired, but I know I will be so thankful when I pull that delicious tomato sauce out of the freezer in January or when I harvest the Swiss chard in September. I sure am glad that the days in August are long! This entry was posted in Garden by Ashley. Bookmark the permalink.